Hello EDHREC! 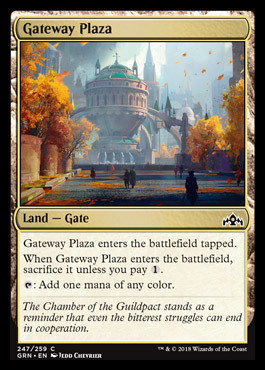 It’s time for the best part of Ravnica: the guildless cards of the set, of course! After all, we all know that no one likes the guilds. #EndOfTheGuildPact. All jokes aside, in this article I’m going to cover the red, green, artifact, and land cards that don’t have any of the guilds’ watermarks. Not all cards will be covered, but I’ll do my best to explain my thought process behind the ones we do observe. As a general rule, we’re trying to find cards that could become relevant in EDH. If there’s something that I missed, please feel free to yell at me in the comments section! Spellslinger decks often have trouble in finding a fair finisher that can stick. Too often they just durdle or “storm off.” Because of this, many players decide to either A) move to combo, or B) disassemble the deck. 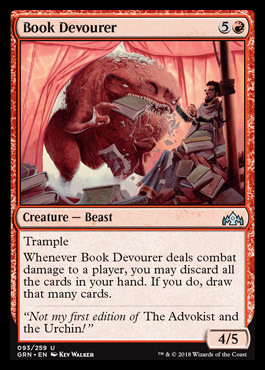 This card is supposed to be a threat, but given that, it demands too much for a payoff that isn’t just there. 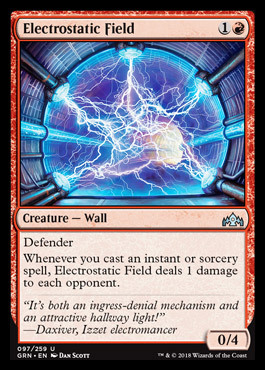 Don’t get me wrong, this card has some potential in non-multiplayer formats, but when factoring in the increasing number of opponents and life, it’ll take too long before getting the job done. Remember kids, there’s always Sphinx-Bone Wand and Runechanter’s Pike! Remember that time two seconds ago when I talked about the things Spellslinger decks need? Yeah, this one is a better example of a situational finisher. It looks similar to Vial Smasher the Fierce in the sense that it benefits from big mana spells and alternative cost spells, but unlike her, we can’t sit back and reap the benefits; we need to be aggressive. 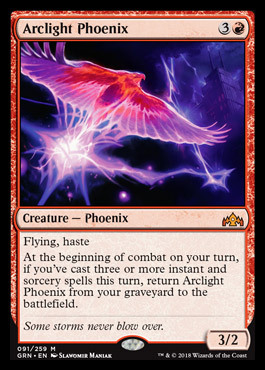 This plays well with extra combat/turn spells, so the likes of Neheb, the Eternal and Etali, Primal Storm may like it. It’s certainly a fun card that can do impressive work. The comparison with Future Sight is unfair. Future Sight is much, much better. As a draw engine, Experimental Frenzy isn’t a good card, as it punishes you for not being able to keep up with the top of the deck, while also punishing for having other card draws spells. 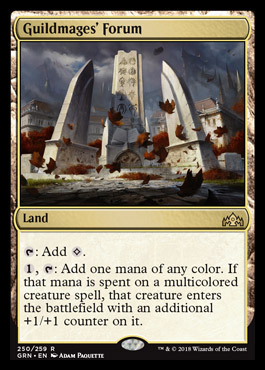 And if you’re paying to destroy it, you spent too much mana for what it could’ve been an Outpost Siege. This card is made for the good and the generous – namely Zedruu, the Greathearted – that want to share their deck with others, especially to those nonred players. This is a decent addition to Storm decks. The ability to activate this multiple times per turn will likely open paths to victory that weren’t there before. 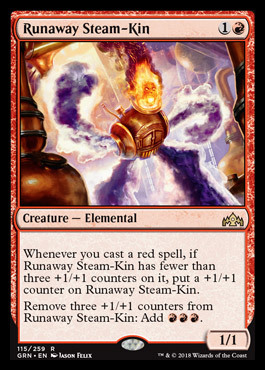 That said, its limitation to just red spells will indeed limit the number of decks that want it, but still this is a strong card in the right shell. Drawing cards is great! Putting cards in the graveyard is also great! This card is flexible enough to see play in a multitude of archetypes, but not strong enough to be playable in them. For 1 extra mana we can play Dragon Mage, and that’ll be almost always better than this. This field is a smaller Guttersnipe, but slightly more resilient against removal. It’s not weak, per se, but we already had Firebrand Archer, and that’s not played in that many decks (only 587 total). Maybe with a critical mass of these creatures we can build a deck based on them. Great utility and great typing. 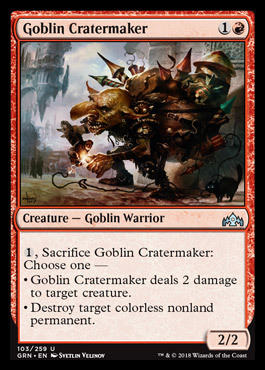 This little Goblin is a team player! 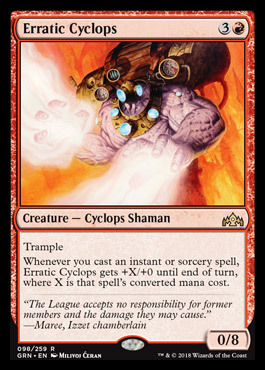 Flexible removal on legs is really good for a tribal deck, and the fact that it can snipe some dangerous commanders like Kaalia of the Vast, Alesha, Who Smiles at Death, and Mizzix of the Izmagnus is a huge plus. This card is somewhat interesting. It supports an aggressive Spellslinger shell that cares about the combat step or extra combat steps. As a permanent source of unblockability, this is cheap enough to be playable. The problem lies in the fact that most of these decks would rather have a noncreature source for this effect. Some versions of Shu Yun, the Silent Tempest may be interested in this guy, but only some. Another Goblin with great supporting capability. 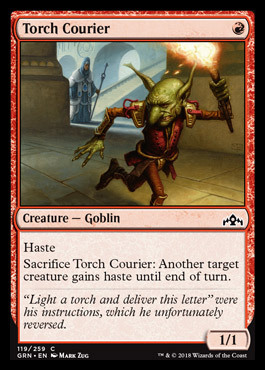 Being able to come early and give haste to your commander on curve is something that should not be underestimated. Not having to pay mana or tap to give haste means that he can give haste to an important creature in a pinch in the late game. Undercosted beaters aren’t as great in Commander, given the huge life increase. The presence of bigger “battlecruiser” threats makes them not really worth it. 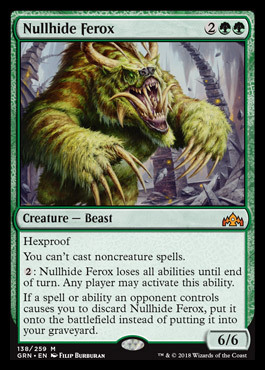 There’s also the fact that Ferox’s kit isn’t well suited for EDH, a format where we constantly have spare mana and board wipes are the norm. Still, as an undercosted green beater, there’s a niche slot for it in commanders like Ghalta, Primal Hunger, Selvala, Heart of the Wilds and even Prime Speaker Zegana. 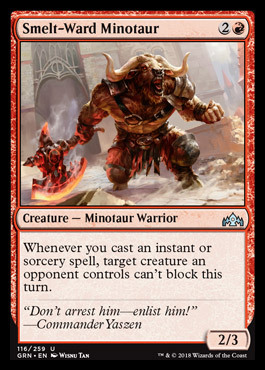 They all want to, in one way or the other, abuse this big boy (in the cases of those commanders, he’s basically either a ritual or a draw spell, and that ain’t nothing). 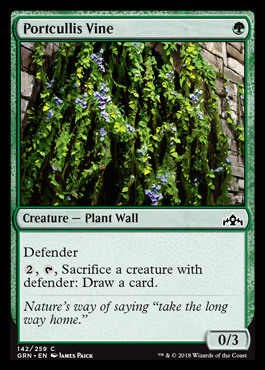 Glimpse of Nature is a powerful card; it allows small creature decks, like Elves, to keep the gas flowing while expanding their presence on the board. There’re two problems that come along with cards like Glimpse of Nature: first, they aren’t creatures, meaning that the more of them we add, the worse they become, and second, many of them cost too much mana. Vanquisher’s Banner requires five mana and a specific tribe. Zendikar Resurgent takes seven mana before we can start chaining multiple creatures into play. Even Soul of the Harvest and Primordial Sage each cost six mana, which limits our explosiveness. Enter Beast Whisperer. 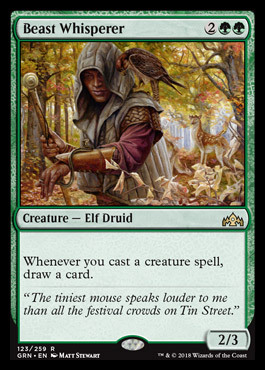 He’s a creature, he’s an Elf, his effect doesn’t depend on conditions like tribe or power/toughness, and he costs only 4 mana. 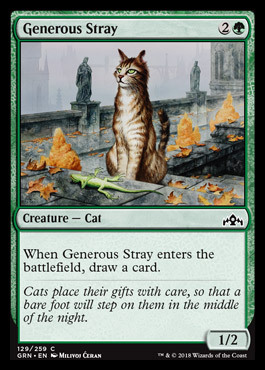 This card is very good, and both should and will be added to green creature-based strategies. Recursion spells are very powerful. Most of them are costed and designed for a single use, which occasionally makes them feel clunky. 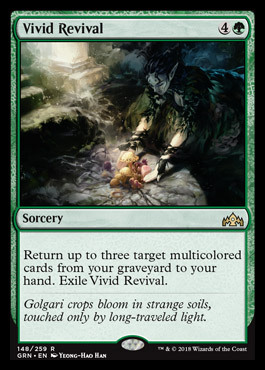 So what about this new one, which takes three of the most impactful multicolor spells that you’ve played throughout the course of the game and puts them back in your hand? The multicolor focus is limiting, but as long as you put this in the right deck, it’s exceptional. Ramos, Dragon Engine players will love it. This is a strictly better Explosive Vegetation, which in itself is playable depending on the deck’s budget. Now add the option of being a better mana fixer and a Maze’s End support card. It’s still not very good – cards like Farseek and Nature’s lore do a much better job of fixing your mana while ramping you in decks with multiple dual lands – but if you’re on a budget and want to play +3 colors, especially in wedge combinations, this card can help you. This is a way to get extra value in a defender deck. It’s kind of expensive and it has to tap itself, but a card is a card, right? Being a defender in itself is nice, since it cantrips with Arcades, the Strategist in play, but I think that Doran, The Siege Tower players will appreciate this draw ability more. This is a fun one. At first, it looks like a worse Walking Ballista (which is okay, because the Ballista is broken), but having the ability to keep getting value from it and being significantly cheaper to cast than Ballista are good selling points. The biggest problem this card has is its color identity. That activated ability means it can only go into five-color decks. This naturally reduces the number of decks that could it, and also leaves us with plenty of other choices that are just better. It’s still relatively decent repeatable removal. 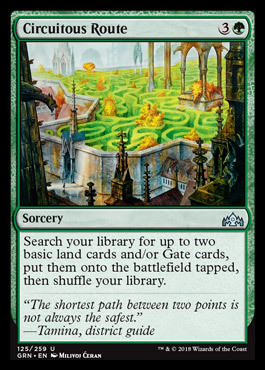 This is a very interesting card for the Maze’s End decks, though exclusively so. The option to quickly finish off a dangerous opponent is very good for deck with such a delayed win condition. Granting vigilance is also nice, so you can get value from attacking while keeping up with defense. This is an overall worse Opal Palace. 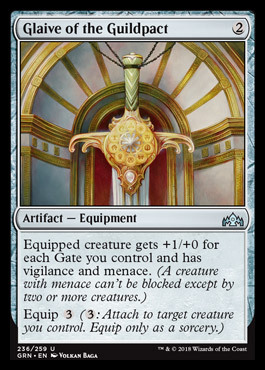 Yes, this can put counters on your noncommander creatures, so if that single extra +1/+1 counter on your creature is important enough, you can play it… but this is more akin to Shimmering Grotto than anything else, and the loss of tempo this card represents is significant. I just don’t think it’s worth the investment. How many nights have I spent wondering when would I get another Rupture Spire/Transguild Promenade variant? Probably zero, actually. Even with the Gate subtyping going for it, there’re many better budget options for color fixing, like the trilands or the Vivid cycle. 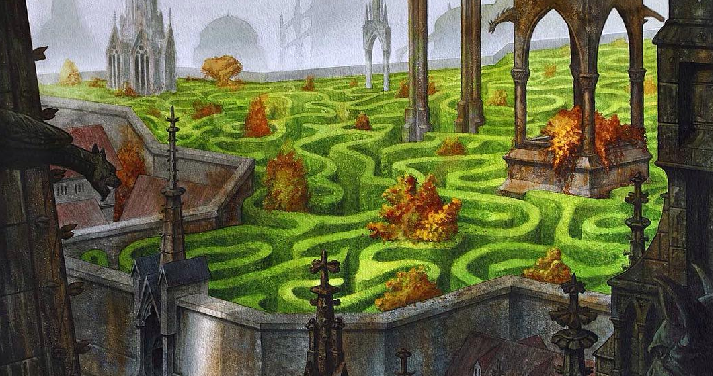 The Maze’s End decks are already slowed down enough with at least 11 ETB tapped lands. I just want to again stress the importance of tempo. All this said, it’s nice the Maze’s End deck have another helper. This is it for my EDH evaluation of the guildless red, green, artifacts, and land cards of the Guilds of Ravnica. I had a lot of fun writing this, and I hope you enjoy it as well. What did I miss? What cards deserved to be here but weren’t? Let me know!